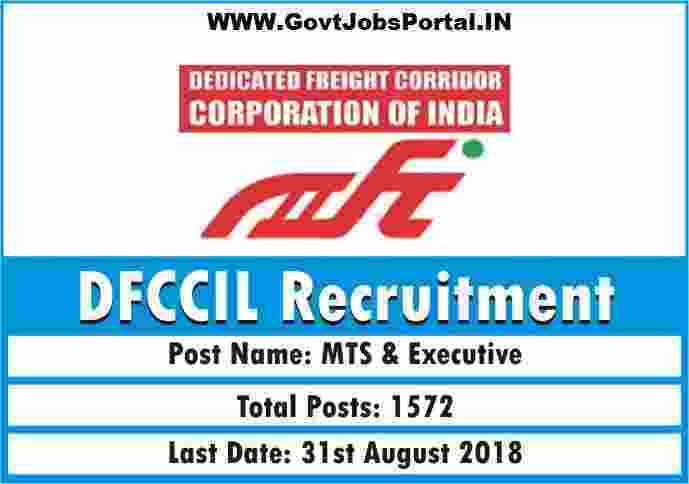 DFCCIL is stands for “Dedicated Freight Corridor Corporation of India”, is a public sector company under Government of India. DFCCIL Recruitment department is going to recruit Indian candidates for various job profile. There are total 1572 vacant posts which are going to filling up through this DFCCIL Recruitment 2018.
i) FOR MORE DETAILS, PLEASE REFER TO INSTRUCTIONS ON THE OFFICIAL WEBSITE OF DFCCIL i.e. www.dfccil.gov.in UNDER " HOW TO APPLY" FOR FILLING UP ON-LINE REGISTRATION FORM AND ALSO THE DETAILED INSTRUCTIONS GIVEN IN THE MAIN INSTRUCTION PAGE OF THE ON-LINE APPLICATION. (ii) CANDIDATES IN THEIR OWN INTEREST ARE ADVISED, NOT TO WAIT TILL THE LAST DATE & TIME AND REGISTER THEIR APPLICATION WELL WITHIN THE TIME. DFCCIL WILL NOW BE RESPONSIBLE, IF THE APPLICANTS ARE NOT ABLE TO SUBMIT THEIR APPLICATION DUE TO LAST MINUTE RUSH. More information about these Government jobs through DFCCIL Recruitment 2018. Read the whole article carefully before applying these Govt jobs. Graduates with 60% marks can also apply. Age Bond: Those who are wishing to apply these Government jobs must have age in between 18 years to 30 years. Education: 10th pass with 60% marks and candidates must have ITI certificate can apply for these Posts. Education: 10th pass + minimum 1 year period Course accomplished as Act Apprenticeship/ ITI approved by NCVT/SCVT with not less than 60% mark in aggregate in ITI. Age Bond: Those who are wishing to apply these Government jobs must have age in between 18 years to 33 years. What is the application Fee for applying this DFCCIL Recruitment ? What is the process for Applying this DFCCIL Recruitment? You can apply for these Government jobs in India in between the following dates 1st Aug. 2018 to 31st Aug. 2018. You can visit to the official website for online application. We also share the link below related to the online application form. 01ST Aug. 2018 is the Starting Date to apply. 31st Aug. 2018 is the Last Date to apply. Disclaimer: We took this information from Employment News papaer "http://employmentnews.gov.in/".